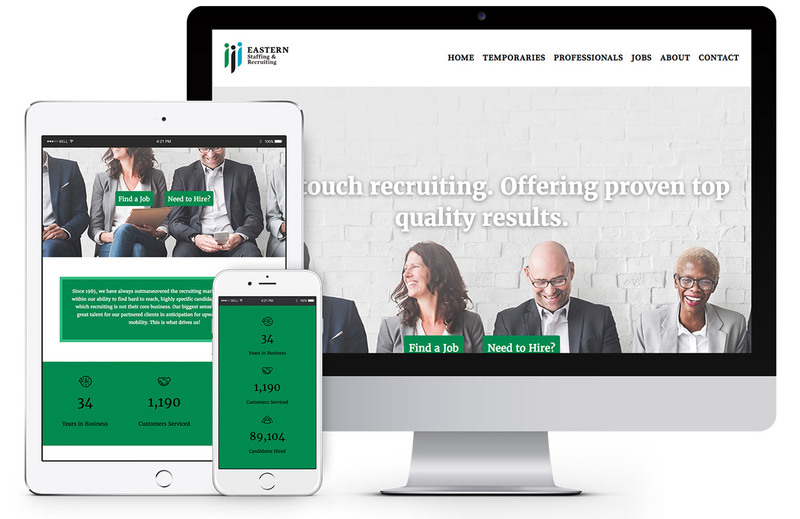 In order to stand out in their marketplace, Eastern Temporaries approached Idea Kraft looking for help with their branding and website. They knew their appearance was dated, and their business structure did not adequately meet the needs of their target markets. With our help, they wanted to restructure in order to have a parent company and sub-brands dedicated to each market. Creating this new structure required our team and the client to identify who their core audiences were, and the unique needs and challenges they faced in the world of recruitment. The services the client offered no longer matched their original brand. 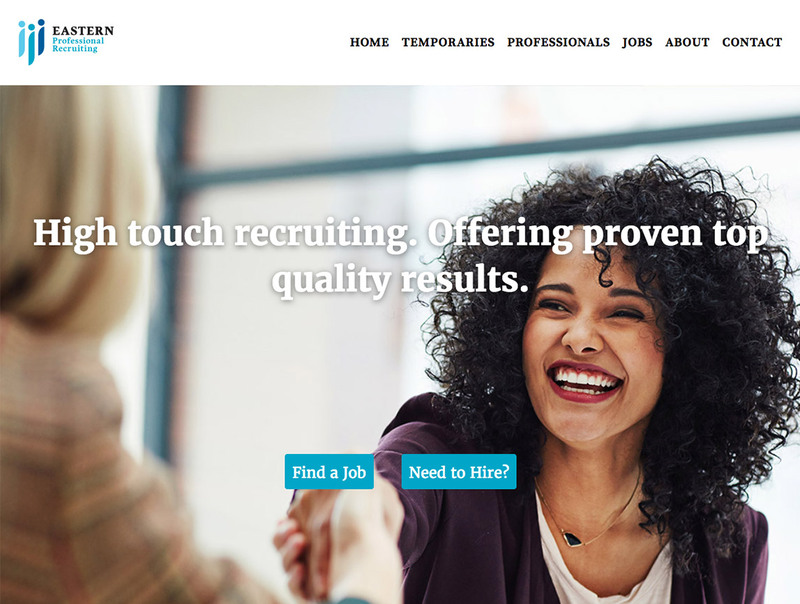 The ultimate goal was to create a new identity system that paired with easy to use web functionality to allow users the simplest experience when searching for a new job. When creating a new mark, we wanted to focus on the core element of their business: job candidates. As the driving force and inspiration of the logo, we focused on the ideas of connection, building relationships and simplicity. The core “parent” logo would remain the same, but each market could now be color coded to help differentiate between the different sides of the business. High touch recruiting. Offering proven top quality results. 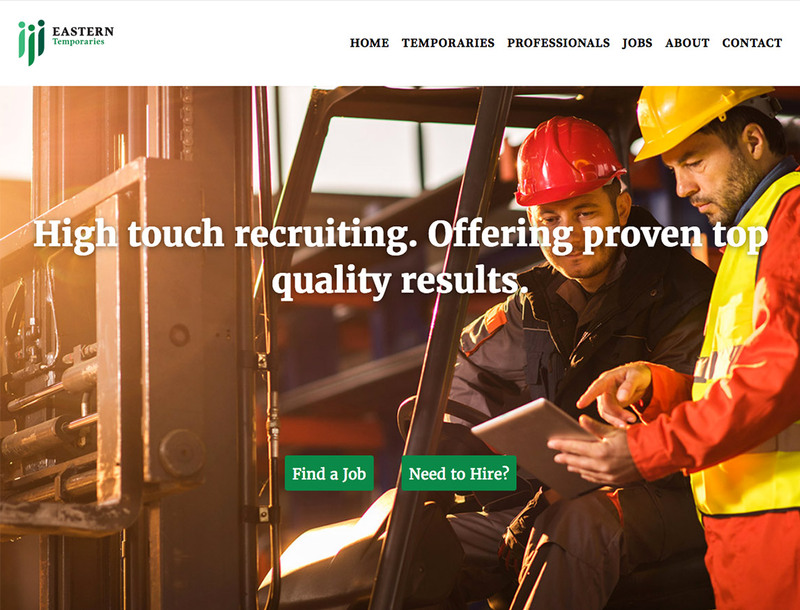 As a recruitment agency, Eastern Temporaries dealt with not only placing temporary workers in short term jobs but also with helping companies quickly and easily find qualified talent for long-term positions. They also serviced companies with administrative support, business services, and customer service. The original brand of “Eastern Temporaries” no longer encompassed all the services they offered. This new expansion of logos better reflects the services offered to the appropriate markets and continues to help grow the professional and technical side of the business. The website needed to perform in a manner that worked for both sides of the business. It needed to be easy to use for those looking for temporary workers, and robust enough to serve the professional side. Creating separate pages for these divisions was key.